How to insert a link to a PDF (or other document file) that is already present on the server? Browse to the page where you want the document linked from and click the Edit Page button. Type the text for the link to the PDF file, if it doesn't already exist on the page, and select it. The text should be in English words such as the title of the document. 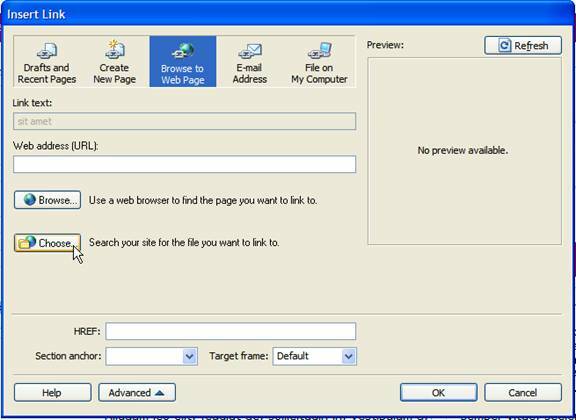 Browse to the PDF file on the server, select the file and click OK.
Make sure the Advanced section is open at the bottom of the Insert Link dialog box. If it is not open, click the Advanced button. Select New Window from the Target Frame drop down list. When you are finished editing the page, click Publish. When the page is published, Contribute will automatically upload file for the page but will not need to upload the PDF file since it existed previously on the server. The link to the PDF will be relative to its location on the server from the page.